We couldn’t provide our vital services without the generosity of people like you. 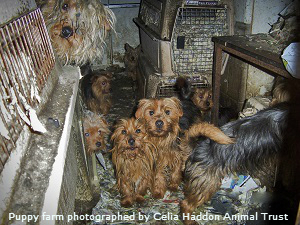 Help us continue our work to bring an end to puppy farming – make a donation to our end puppy farming campaign. Take a look at the picture below. Puppy farms like this are hidden, remote and secretive, so images are rare. Yet we know dogs like these are held captive to breed hundreds of thousands of frightened puppies across Britain and Ireland. Innocent dog loving families are too often unaware that they may be at risk of buying a puppy from an unlicensed puppy farm where the motive of the breeder has been money rather than dog welfare. Infected with parasites, many puppies need emergency treatment for diarrhoea, vomiting and dehydration within 24 hours of purchase by unsuspecting buyers. If they survive their first year, these puppies can suffer from skin disorders, weight loss and claustrophobia. To sell these dogs, traders lie about their breed, their upbringing and their health. They even pay people to sell the puppies from to make them look they were bred in a family home rather than a filthy breeding shed. It is criminal behaviour, rife across the UK and must be stopped. The terrible numbers show that up to 400,000 farmed puppies are sold to the British public every year. All have been exposed to disease in the breeding sheds. None have known love and care in a family home. As for the unsold puppies and exhausted breeding dogs, we may never learn the full scale of the brutality. Thanks to YOUR support and campaigners across the country, the UK government has finally listened and is taking real action to improve the lives of so many innocent dogs and cats. Puppy farmers will no longer be able to hide behind unscrupulous dealers and the fake cover of pet shops. It’s a fantastic step in the right direction! Sales of puppies and kittens under eight weeks old BANNED! Number of litters REDUCED! Now, anyone breeding three or more litters a year requires a breeding licence (down from five). Commercial third-party sales of puppies and kittens ABOUT TO BE BANNED! Online pet sales to include licensed seller’s licence number, country of origin and country of residence of the pet REGULATED! However, cruel breeders will STILL find ways around the law to boost their profits. The demand for puppies is huge. It has been reported that puppy smuggling gangs can make up to £35,000 per week from illegally transporting puppies to be sold to unsuspecting families in the UK. These criminals feed off current marketing crazes for designer dogs with no consideration of the welfare of the puppy or their parents. Please donate whatever you can and help us end the intensive farming of dogs. Your kind donation will help us stop the cruelty and exploitation of battery bred dogs and their puppies. How the puppy farming industry operates in the UK today.